Throughout the spring, MealFlour traveled to Santa Apolonia in Chimaltenango to meet with the group of women in our new train-the-trainer program. After learning the farming process, the women made two recipes that use mealworm powder; a savory mealworm flour bean dip and healthy banana pancakes. Their farms are too young to collect mealworms to make flour, but they are doing well and each farm has gusanitos (baby mealworms)! In collaboration with our partner organization, ADEMI, the women will receive support and follow-up for the next several years. 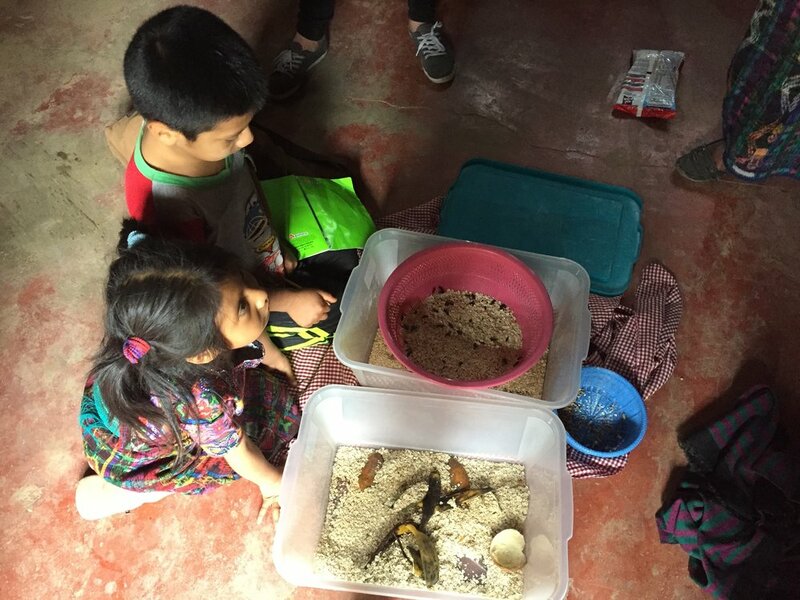 Nearby in Chimaltenango, MealFlour visited a Guatemalan insect farmer who raises yellow mealworms, crickets, cockroaches, and a species of giant mealworms. He also raises lizards (pictured) and birds. We are hoping to work with him in the future to promote edible insects at sustainable agriculture events throughout the country. In April, MealFlour traveled to Huehuetenango to shadow Fundación Contra el Hambre Guatemala (FH, Foundation Against Hunger). FH is an international organization, and in Guatemala they work with communities in Huehuetenango, Quiché, and Alta Verapaz. They are interested in incorporating mealworm farming into their nutrition and education programs, and MealFlour will work with them to pilot programs in a few of the towns they work in. There isn't just one way to make farms! Gian Mario, MealFlour's intern from Italy, created several innovative models for mealworm farms. They are all made from either upcycled objects or cheap materials that can be found in the markets of Guatemala. Pictured are farms made from old roof material, repurposed styrofoam, restaurant take out containers, and beverage cans! Local urban organic farmers in Xela have also been experimenting with farm materials. The organizers of Xela's monthly organic food market use old shoes to hold plants, bottles for flowers, and they are using jerry cans to separate the life stages of mealworms! For this year's International Women's Day, MealFlour demonstrated the program in New York City at SAP America alongside other incredible women. Living in the DC/Maryland/Virginia area and curious about edible insects? MealFlour recently teamed up with Cultivate the City to bring mealworm farming to the DC area. In April, we did a free "Introduction to Mealworm Farming" demo. If you're ever in the area, stop by H Street Farms to see Cultivate the City's awesome rooftop garden and check out a mealworm farm. Summer and Winter Olympian from Tonga, Pita Taufatofua tried and loved a MealFlour protein cookie at this year's MIT Solve! New breakfast of champions? Other guests at the conference included Prime Minister of Canada Justin Trudeau, cellist Yo-Yo Ma, Eric Schmidt, Ursula Burns, Cady Coleman, and more. MealFlour presented at the conference and met representatives and leaders from several organizations that are excited by the work MealFlour is doing.